ANTECEDENT OFFERINGS Featuring re-recordings of Crushed and Artistic Butchery. They are limited to 500 copies and over half have already been sold during pre sales. Brutality® was formed in 1986. In 1988 they released their first demo “Brutality” which gained them recognition in the underground fanzines. Their 2nd demo “Dimension Demented” was recorded in 1990 releasing a 7-inch EP on Gore Records called “Hell on Earth”. 1991 saw the release of “Metamorphosis” a cassette EP that received worldwide distribution on Wild Rags Records. After necessary lineup changes in 1992, the band propelled forward and into the studio to record a new demo. The band utilized this demo to shop for a record deal and found interest from many different labels. They signed with Nuclear Blast Records and released a 2-song, 7-inch EP called “Sadistic”. Brutality’s first album “Screams of Anguish” was released in 1993. They toured with Hypocrisy in Europe and crushed venues with their dark metal riffs. The bands 2nd album “When the Sky Turns Black” was released in 1994. The release of “When the Sky Turns Black” spawned a European wide venture where they toured with Bolt Thrower & Cemetery. With continued efforts to improve their sound and direction, additional lineup changes were made in 1995 and they started writing their 3rd album “In Mourning”. This, their 3rd and most recent album was released in 1996. 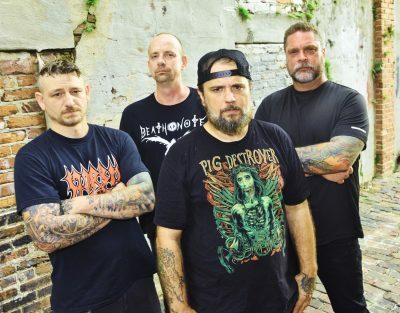 The band continued to play regional shows and US Metal Fests and in 2003 the band recorded a 3-song demo which was never released due to sub-par songs and recordings. After years of success Brutality’s band members decided to disband, to pursue personal gain with family and their careers. All three of Brutality® albums were re-mastered and released in 2008 on Metal Mind Productions with unreleased bonus tracks. Mid 2012 Brutality® reformed and has plans to invade a venue near you in the near future. This entry was posted on Monday, December 10th, 2018 at 10:40 am	and posted in NEWS. You can follow any responses to this entry through the RSS 2.0 feed. « In Demoni :: Their second full-length ‘The Grand Slam’ is out now on Rotten Cemetery Records! Brutalism at its finest!